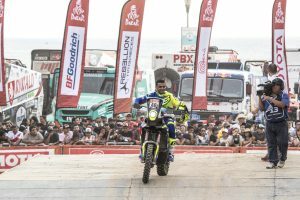 Jaipur, January 07, 2019: The Sherco TVS Factory Rally Team began their Dakar 2019 journey with a ceremonial flag off held in Lima, Peru today. This is the fifth consecutive participation of the team in the iconic Dakar Rally. This year, the team boasts of 4 riders – Michael Metge (France), Adrien Metge (France), Aravind KP (India) and Lorenzo Santolino (Spain).